A double or mimic of the famous Space Hunter Samus Aran, like the Samus Aran - X she would encounter years later this entity was determined to kill Samus Aran at every opportunity it got. Genetically the Dark Samus appeared to be identical to the original Samus, but when Samus encountered the Dark Samus near the end of her mission on Aether, its alien origins became clear as its armour had become transparent, showing the Dark Samus’s internal structure and physical differences such as a three eyed skull. Origins of the Dark Samus are hard to determine but it was clear that the organism was not native to Aether or its other dimensional counterpart. 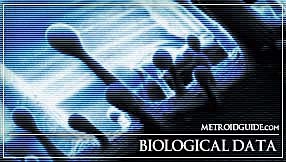 Rumours in the scientific community go as far that the Dark Samus might somehow be connected to the Tallon IV incident; in particular to the organism designated the Metroid Prime. In Samus her own report she mentioned how the Metroid Prime in its pure but unstable Phazon form tried to absorb her to make her perhaps its new host body. 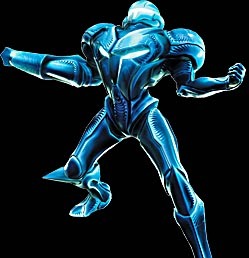 Instead all it managed was to rip the Phazon suit from Samus her normal armour. Equipped with the same systems as Samus her armour and possibly carrying enough of her genetic material, the Metroid Prime used the DNA to form itself into a humanoid form, and turned the Phazon suit into a complete Power Armour suit it used as a protective shell. Somehow it even gained the knowledge to understand and use technology. However during this transformation the Metroid Prime lost its ability to generate Phazon and as most Phazon was destroyed during the collapse of the meteor crater it now had to look for Phazon to feed on somewhere else. Using its new form and knowledge the Metroid Prime turned Dark Samus stole a transport from the Pirate survivors on Tallon IV and went into space to look for new Phazon deposits. Perhaps it monitored the Space Pirate’s transmissions, or had found their stellar observatory at the Phentara Drifts, or simply followed some instinct; the Dark Samus found its way to the planet Aether where it attacked the Space Pirate base there for the Phazon supplies and to free the Metroids that were being held there to serve as energy sources. It soon learned that most of the Phazon could be found on Dark Aether and how to activate the portals that led to this dimensional counterpart. There it continued to ‘feed’ on Phazon while managing to avoid the Ing, perhaps it’s partly Phazon based structure prevented any Ing even as powerful as the Emperor Ing from possessing it. When Samus Aran arrived on the planet, Dark Samus had entered the Marine’s base in search of a portal that lead to Dark Aether. Samus was witness to this event and followed the Dark Samus through the portal. She saw how the Dark Samus extracted energy from Phazon, when she tried to confront it the Dark Samus destroyed the Light Crystal whose field protected Samus until that time. Not seconds later several Warrior Ing attacked Samus and stole crucial Chozo equipment which Samus later had to gain back by defeating the Ing that possessed it. Later when Samus infiltrated the Space Pirate base on Aether the Dark Samus had already infiltrated the base earlier and was now on its way to the reactor room to absorb the Phazon there that was used for energy production. In the reactor room Samus confronted her nemesis in what would be the first of several engagements during which the Dark Samus gained several new abilities. At the end of the battle it seemed that the Dark Samus self destructed, but when Samus entered the underground rooms of the Torvus Bog she witnessed how the Dark Samus rematerialised and challenged Samus to come find it. This did not take to long. After having visited the Sanctuary Fortress and having collected crucial items Samus headed back to the Temple Grounds, but when she reached the bridge that lead to the elevator connecting the fortress with the temple grounds, the Dark Samus came in between and destroyed the bridge, probably to prevent Samus from becoming to strong. Still Samus managed to overcome this setback and later faced the Dark Samus again who was fighting several Ing possessed Space Pirates for their Phazon supplies. By the time Samus had entered this room the Dark Samus had moved on to an elevator which shaft contained Phazon. Again Samus faced the Dark Samus in battle during which the Dark Samus showed it new skills. When Samus defeated it, the Dark Samus rather preferred throwing itself of the fortress than allow itself to be captured by Samus Aran. The last time Samus faced the dark counterpart was after she had destroyed the Emperor Ing who commanded the Ing horde and was protecting the planetary energy that kept Dark Aether in existence. Having absorbed the planetary energy, Dark Aether was deteriorating fast and Samus had to hurry in order to escape the planet’s collapse. The entrance that lead out of the chamber was suddenly blocked by a layer of Phazon, when Samus turned around she faced the Dark Samus who by know had absorbed so much Phazon that its structure had become critical. Perhaps because of the high levels of energy it had absorbed it had regained the ability to create Phazon. After an excruciating fight Samus defeated the Dark Samus for the last time on Aether, having suffered from the severe levels of Phazon it carried and the fight, the Dark Samus in a strange way expressed its defeat before collapsing into loose particles. Either the Dark Samus truly died on that moment, or perhaps the Dark Samus managed to escape once again through teleportation. The last possibility remains open. The Dark Samus wore a variant on the Chozo Power Armour Samus wear, although it was coloured black and seemed to be more organic in design; predator like. Huge amounts of Phazon could be detected in the armour with the largest concentrations in the shoulders were in Samus her armour the suit’s power generators are located. Dark Samus her armour was equipped with a shatter version of the Power Beam, the Dark Samus was also capable of firing a concentrated Phazon Beam when overcharged, last; it was also armed with a missile launcher. 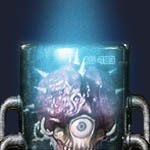 Other offensive features were the Dark Samus ability to project energy fields, turning itself into an energy projectile. This ability was also present in its Morph Ball mode. When overcharged through Phazon the Dark Samus could generate an almost impervious energy shield that could only be pierced by a Power Beam charged with Phazon. The Dark Samus could also fire concussion strength blasts and fire Phazon projectiles. It were these last that allowed Samus to defeat her nemesis by collecting the Phazon particles into her arm cannon while charging her Power Beam, firing Phazon Beams as a result. Dark Samus had superior reflexes, being able to move at speeds faster than Samus is capable of and jumping higher. The Dark Samus could also make itself invisible in the visible spectrum, requiring enhanced visual detection gear to detect it. Last, the Dark Samus is capable of teleportation; this effect can be deceiving as it appears that the Dark Samus self destructs, its body collapsing into loose Phazon particles. These particles also give away the Dark Samus its presence before rematerialising. The following is classified under the Federation Espionage Law and for selected personnel only. Class organism: Xeno organism with human biological traits. Colourfully named the ‘Dark Samus’ by the profile writer of the earlier more public file, Federation Special Operations insists that possibility is investigated that the organism has survived the Aether incident and if so that it will be actively monitored in the future until a method is devised to capture it so it can be transferred to a class Silver research facility. Capture and study of the Dark Samus could increase Federation scientific and technical knowledge drastically in the field of Phazon application on organisms and technology, as well as better understanding of Chozo technology regarding Power Armour. Furthermore if Federation operatives would be able to adequately tame the Dark Samus or perhaps create a form of understanding it would be possible to employ the Dark Samus in return for supplies of Phazon material it desires for its own continuation. Federation Command would have an operative that has the same capabilities as the Space Hunter Samus Aran and no longer have to depend on the questionable loyalties of the last when assigned to missions regarding the Space Pirate Legions or Metroid organisms.